With beginner crocheters in mind, here is a shrug that is simple yet sassy. If you can crochet a rectangle then you can easily crochet this. The basic idea is to first crochet a rectangle and then sew up the two ends to form the sleeves. It is just as simple as that! Anyone can fit into this shrug since it can be easily adjusted. Just follow the instructions within the pattern to adjust the sleeves and the length as needed. Note: If the shrug is not the width that you desire (from the end of one sleeve to the other), continue to repeat the last row in the pattern. To create sleeves, fold your work in half such that each row is folded in half. Starting at one end, sew piece together until you have sewed the length of 12 rows. Sew together the same length on the other side for the second sleeve. 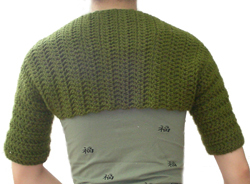 If you chose to alter the size of this shrug you may also want to alter the length of each sleeve. 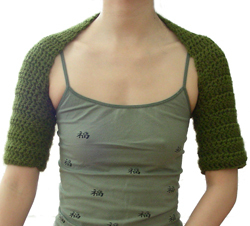 If you need help crocheting this shrug, just leave a comment and I would be glad to help! This entry was posted on Monday, May 4th, 2009 at 12:00 AM by Rachel Choi	and is filed under Free Crochet Patterns. You can follow any responses to this entry through the RSS 2.0 feed. You can leave a response, or trackback from your own site. This is great. I think I can adapt it to make a sweater for my son’s little dog. And a shrug for myself. Love The New Things. Love This Shrug, Although I Think It Needs To Come Down Longer In The Back, Like Maybe To The Waist.I Would Wear Something Like This If It Were Longer.Not Crutizing Just Suggesting.I’D Be Glad To Be One Of Your Pattern Testers. Think Ya Can Come Up With Someting Longer In The Back Like This ? I’ve Been Busy, The YArn A Flyin & The Hook A Stitching, Busy As A Bea Makin Baby Things For The Little One That’s On The Way. I remain in the first portion of the crochet learning curve. I attempted another shrug and failed. I used 2 of the same color and type yarn but the one I started with I had used on something I had messed up on and unraveled. Once complete the each sleeve looked like it belonged on different sweaters. So I thought I would attempted a new one with new yarn. I like this but if there was a way to make it longer and a little more coverage in the front. Thanks so much for sharing your pattern with all. It is extremely kind of you to share your knowlege. Thank you so much for this pattern idea. I was making one for myself and I knew you could make a rectangle and fold it in a way to make the shrug, but your intstructions just help a little more. I have four weeks to make the shurg to go with a halter dress that I bought for a wedding. Do you think I could use this same pattern with linen yarn? Very cute pattern. I’m thinking it would be fun to tinker around with it and make it in little girl sizes. I was looking for a shrug pattern and I ran across this one. I love this pattern very easy to follow, fast and cute!!! I want to thank you for sharing your patterns. “2 THUMBS UP”!!!!!!!!!!!!!!!! I would like to know how can I adjust this shrug so it can be longer in the back and more in the front? Hi Nicole, you can crochet around the opening of the shrug after you’ve sewn it together. Love your patterns. I want to make this for my daughter’s American Girl Doll. Any tips? Hi Laura, you can adjust the shrug using the instructions within the pattern to fit any size, including a doll. The initial chain should fit around the largest part of the arm, since it will be the size of the sleeve. Then repeat row 2, until you have the length from elbow to elbow (or as long as want it). This is awesome! I can’t wait to get started on it!! if i were to do this, how would i tweak it to make the shrug come down and make it more like a cardigan rather than a shrug? Thank you once again for another great pattern. I’m about to make it for my baby girl to match a pair of capris I crocheted her. I just finished this shrug for my 16-yr old dauther. She frequently goes to the local YMCA and likes to stay covered unitl her work-outs begin. This shrug works perfectly with her exercise tops which are often open on the shoulders. Thanks for such a simple, yet attractive project! I made the one for my daughter using Hobby Lobby’s “I Love this Yarn” in Peacock……quite beautiful. The pattern for the Sassy Shrug came at a good time !! Have G’daughter graduating from high school. They must wear dresses,shoulders must be covered. Unfortunately, all the cute little spring dresses have spaghetti straps, or are sleeveless. Your cute little shrug has saved the day for her/me !! Made 1st one from sage green bamboo yarn to wear over a black spaghetti strap dress for awards day. Now I am working on a soft yellow one to wear over a cute plaid dress……with spaghetti straps, of course. target, or even $19.99 @ Old Navy. Didn’t even price them anywhere else. Don’t ‘cha love it ??? Crocheted with love and in the right colors too. I think this is the perfect size for a “shrug”. If more of the back was covered (like someone mentioned earlier) I don’t think it would be considered a shrug. Great job!! this looks really fun, fast and easy…much easier than trying to design my own!!!! thank you for saving me rachel! Rachel, I like the shrug but I chained 50 chains after measuring around one arm. Should I have measured around both arms and chained the total? Do you increase the rows as you go up or stay with say 50 dcs in each row? I also would like it to come more toward the front. I guess I need a longer triangle for my size of a large shirt. I crocheted a chain of 50 because I measured my left arm . I believed that I should have chained about 100. Should you measure both arms and chain the total of that. I believe I need a bigger rectangular to meet more toward the middle. Do you increase each row or stay with the first measurement? Hi Mary, measure around the largest part of your arm as you’ll use this measurement to determine how round the sleeve is. You can make it looser if you don’t want it so tight. If you would like to make it cover more of the front part of the body, you can crochet around the front opening the shrug after you make it. Let me know if you need more help! Hi Rachel, my friend and I are attempting to make this beautiful shrug. She did hers and chained 42 rows. Now we’re reading the pattern which says to fold in half? We are not good at reading patterns! LOl. Hi Miriam, the piece you are crocheting should be a long rectangle since you are crochet each row with the same number of stitches. You’ll need to fold the finished rectangle in half and sew the ends to make the sleeves. You don’t have to worry about shaping the shoulder area. Once the sleeves are in place, try it on and it’ll end up curving around your shoulders naturally. I’m making this now, can’t wait to finish it. It’s going to be so cute!